Classic Monsters Bride of Frankenstein (1935) Ultimate Guide - from the UK! Rondo Voting Ends Apr. 20! 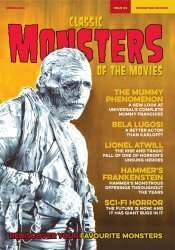 MyMovieMonsters.com > Monster Magazine Marketplace > Classic Monsters Of The Movies (UK) > Ultimate Guides > Classic Monsters Bride of Frankenstein (1935) Ultimate Guide - from the UK! 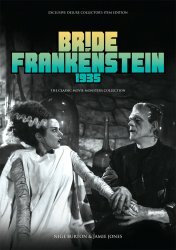 Direct to MyMovieMonsters.com from the creators of Classic Monsters of the Movies magazine in the United Kingdom: The Bride of Frankenstein 1935 Ultimate Guide evokes the brochure you might have bought at the cinema in 1935! It is a luxury magazine dedicated to the James Whale classic. We ship same or next day so don't wait for the UK! The acclaimed 1935 movie Bride of Frankenstein is the subject of Stripey Media's fifth Ultimate Guide brochure. And what a subject! Even today, the atmosphere, styling and performances in this movie weave a powerful spell for existing fans and first-time viewers alike. Authors Nige Burton and Jamie Jones explore the many ways in which Bride of Frankenstein makes for compelling viewing, from James Whale's wry humor, to the pathos of Karloff's Monster and the anti-chemistry with Elsa Lanchester's portrayal of his doomed mate. This luxury magazine guide is crammed with high-quality photos, posters and lobby cards, as well as trivia, behind-the-scenes information and biographies of the cast and crew who made this movie so special. Any fan of Universal monsters, Boris Karloff or classic horror cannot afford to miss this guide. It's the must-have publication for any true Bride of Frankenstein aficionado. Magazine specification: 36 pages. Full color throughout. Packed with photos, posters, articles and info. Printed and finished to the highest standard on thick paper stock. While supplies last we also offer issues of Classic Monsters of the Movies magazine, additional Ultimate Guides, Scrapbook, The Monsters Day-By-Day Almanac, and more. Shipping Note: This item DOES NOT qualify for Media Mail shipping according to USPS policy. Only bound books and DVDs/VHS on this site can be shipped using Media Mail.